I turned away from Twitter to see what was the matter. “The upgrade, I fear, is damaged beyond repair”. With many apologies to Clement Moore and poetry fans everywhere, I could not resist having a bit of fun with this latest adventure in SAP upgrades. I could have continued with the poetry, however, I could not find anything to rhyme with MAIN_PROFEND/KX_CHANGE_PUPG! BACKGROUND: The upgrade was from NW 7.01, SP16 BW to NW 7.31, SP 04 BI — ABAP standalone. The upgrade of the sandbox system had been relatively uneventful, so I was definitely not expecting an issue with the BI development box. The MAIN_PROFEND phase is near the end of the Execution stage for the Software Update Manager — very close to the completion of the entire upgrade. The screenshot provides one clue that provides some hope for a solution: “see F:\******\SUM\abap\log\SAPCPE.OUT for details”. As most Basis admins know, SAPCPE is the process that runs during the SAP startup process and is responsible for copying the executable files from the shared executable directory to the local executable directory. My first guess was a file permission problem or an executable running (like sapstartsrv). However, since this is a Windows 2008 server, it seemed somewhat unlikely. And of course, it had nothing to do with permissions. In the details of the log file was the message that 33 files were not found in the source directory. Of course all of the files were there. Comparisons with the sandbox server, the QAS and PRD servers could find not a single file missing from the directories. All of this consumed around 4 hours of time searching SCN, ServiceMarketplace, Google and several rocks in the landscaping around my house without success. I finally searched ServiceMarketPlace for sapxxcpe.c (presumably a reference to the error line in the source code). This yielded SAP note 1785829 titled “sapcpe failed to copy files”. The issue is the continuing incompatibility of Windows and Unix text files — specifically the Windows CR+LF character mis-interpretation by Unix. sapcpe uses the files are the *.lst files to determine the expected file inventory in the directory. As described by the note, I opened all 7 of these files in SAPpad and saved them with Unix-style LF character. Fortunately for this SAP Basis consultant, SAP note 1785829 saved his Christmas shopping time (with a few hours to spare!). The upgrade was completed without further problems and the system turned over for testing — after Christmas. 1) There is not a great volume of knowledge regarding SUM from the SCN community. There are 100s of notes and PDF documents without question. What is not out there are discussions — with resolution or blogs providing insight into some of the problems that can be encountered. 2) Because of point 1, if you hit a problem with your upgrade do NOT limit your focus to only upgrades or installations. As this case proves, an issue that might occur during normal operation can also occur during an upgrade. 3) Windows and Unix have coexisted for over 30 years. Why do we still have this stupid new line incompatibility problem? And for SAP development: why can’t an additional bit of code be written to check for this? Can I make this my first wish for the new year? So accept this modest addition to the Software Update Manager knowledge store on SCN. And may you 2013 be filled with happiness, prosperity and NO upgrade problems. Looking back, that tweet looks more appropriate for a young “fresher”. It was instead from a somewhat grizzled veteran who should have known better. If you expect this blog to be a step-wise how-to guide – you are in the wrong place. The Service Marketplace: https://service.sap.com/erp-ehp-inst has all the documentation you could ever want. Grab the EHP6 Master Guide as your guide-book or GPS. Next read the Upgrade and Update Guide for EHP6. In this document are the latest SAP notes for EHP6. Download all notes that pertain to your landscape for the upgrade. Read and re-read all the downloaded PDFs and SAPnotes. Read the Software Update Manager (SUM) guide, particularly if this is your first experience with this upgrade tool. Make sure that ALL of your systems are up-to-date in your SLD and SolMan. The sandbox system I planned to upgrade was the only ECC 6 system that had not been updated since last support pack installation. When LVM was introduced last year, I quickly got it downloaded and installed. The tool is not quite as good as I hoped. REALITY check for ABAP systems it is quite possible to have many “correct” (ie. status green) solutions for the relevant products. (lost time: about 3 days due to a messy SMSY in Solution Manager). Add about 50% to the disk space usage for the SUM install directory and the directory where the downloaded support packs are stored. All of the support packs are copied to the SUM/data directory for unknown reasons. Download the latest version of the tp executable from SAPService marketplace. Keep the file handy so that you can copy to the correct directory locations during the SUM process. Open a document and screenshot EVERY dialog screen and add notes immediately. This can be a huge timesaver later. 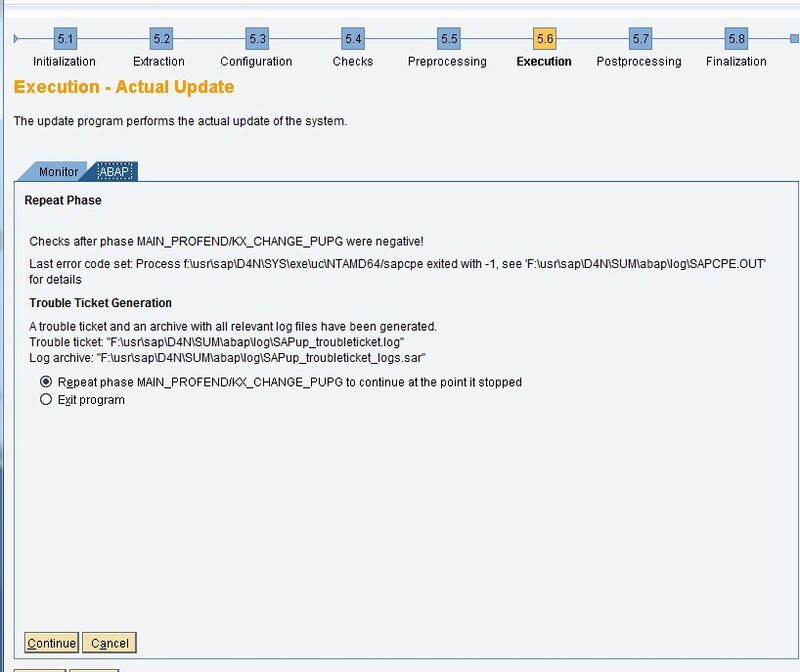 In stage 5.2 a dialog listing 20 or so SAP notes to review and implement will stop the installation process. Relax- on our system only 2 notes were needed. Add these to the preparation check list so that the next system is prepped before starting SUM. For SAP enhancement packs and compatibility with third-party add-ons, the answer is always 1324910. The short translation: SAP will not provide any support. You must contact the vendor for resolution. If your maintenance contract with your vendor is up-to-date, the proper workaround for the upgrade conflict should be readily available. It’s required the vendors to provide you the “Deletion CD”. However, currently it’s not possible for the vendors to provide an “Deletion CD” to delete the add-on. Again please contact the vendor to get the appropriate key for you to continue the upgrade. So after 1 month of back and forth with support, is it actually an SAP problem? How can a vendor provide a deletion CD if SAP has not enabled it? The vendor has been less than helpful as well. The best offer provided was for us to purchase a new license + maintenance + configuration consulting. The total was over $100K US – for a product we do not use. We have chosen not to accept this as a solution either. SHOUT-OUT — I would like to recognize some SAP support folks. First via Twitter: @SAPSupportCE – particularly Patricia, was helpful in getting the message unstuck after 5 days in the status “Message Sent to SAP”. Also, the SAP CIC phone support team has also been helpful on several occasions in getting the support people to respond to my questions. We are now examining various “manual” options for getting around this problem – without compromising the future supportability of our systems. This situation is probably unique in all the SAP landscapes in the world. There is certainly no information on SCN or through Google that comes close to this situation. I do not believe that any of the third-party add-in vendors, including the particular vendor in our situation are acting with bad intent. At the same time, I will never accept a new third-party add-in that does not come with a documented removal process. That process will be tested repeatedly during the initial set up and configuration. And the process will be reviewed every year during DR review time to ensure the procedures are still correct. SAP is on a roll currently. Record breaking Q2 financial results, lots of shiny new products: HANA, Cloud deliveries, SuccessFactors, Ariba, mobility and more. All of this new technology is amazing, transformative and may lead major IT transformations to come. But back here on earth, the vast majority of SAP customers are still using the boring old stuff. We are running systems that bear the scars of numerous upgrades, support packs and customizations. These boring old systems are the ones that are running the business of the companies that are SAP’s customers. At times, one wonders if SAP has not become a little too focused on the shiny new stuff and forgotten those of us still working on with the legacy, tried and true, systems. UPDATE: To restart the upgrade process, a Kobayashi Maru solution was implemented in our sandbox system. 1 Duel is a classic thriller movie: http://www.youtube.com/watch?v=5MtAMc4i8OA starring Dennis Weaver, directed by some kid named Steven Spielberg.